Literally, the Bible of Creativity. Go[o]d or Evil? An international bestseller, million of readers, widely acclaimed as the Bible of creativity - I was so eager to read this book but I was not prepared to see the word God (aka The Great Creator) cited so many times. “Creativity is God’s gift to us. […]. My dreams come from God […] This is the hand of God moving through your hand as you write […].” Does that sounds like some religious textbook? This does not need to be that way. As the author mentions, “When the word God is used in these pages, you may substitute the thought good orderly direction or flow. […] Think of it as an exercise in open-mindedness.” I did not succeed. I was blocked, a great irony for a book presented as the primary tool of creative recovery for blocked artists. What I find regrettable is that most of what the author attributes to the God of Creativity is nothing more than the capabilities of your brain, in particular of its diffuse mode, the part of your brain that works when your mind is wandering. We all have experienced a situation where a solution to a problem pop in our mind after we have stopped trying to find it. There is no magic. Just some misunderstood pages in our brain manual. If you set aside all the God references, the author did a good job to put people in touch with the power of their own creativity. Can we teach creativity? Not really, but we can teach people to let themselves be creative. This is what The Artist’s Way is about. It show to anyone who doubt about that that creativity is our true nature. The book is divided in twelve week-courses, each section dealing with some specific issue. To quote the author, “Reading the book through is not the same as using it”. So, each chapter includes a list of tasks, and a weekly check-in. As I didn’t do them meticulously, I couldn’t share my experience, but, one thing for sure, the content was heavily tested during several decades on blocked or injured artists - painters, poets, potters, writers, filmmakers, actors, and those who simply wished to be anything more creative in their personal lives. I also found the book takes too much time to really start. The author decides to add context to the book by explaining its origin and history. On a positive note, the book is full of quotations, which support the ideas and demonstrate that the subject was profoundly researched by its author. If reading the “AA guide” of creativity does not scared you, and if the inner artist in you need some help to get started, the book deserves your attention. 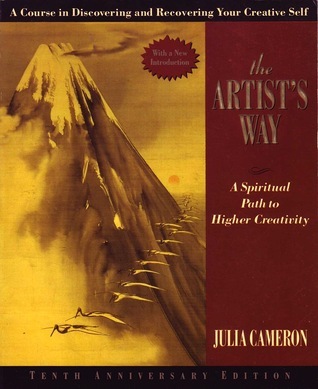 If you are more confident and seeks advices on artist’s practices, this is not the right book. Steal Like An Artist or Daily Rituals: How Artists Work is a good start.